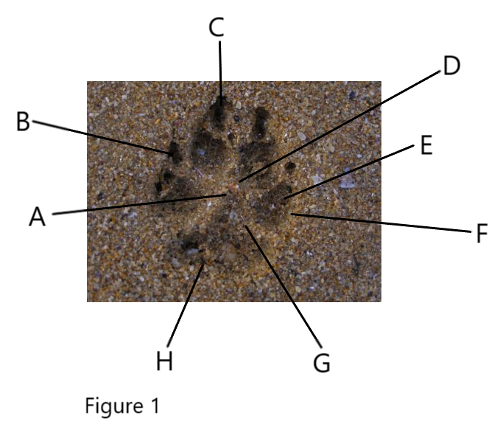 The ability to differentiate domestic dog tracks from the tracks of other mammals (such as coyotes, wolves, foxes, and cougars) is a helpful skill for many purposes, especially anyone using tracking for mammal surveys. The pads and other structures of the feet are composed of keratin, collagen and adipose tissue (fatty tissue). The digital, and metacarpal/tarsal pads serve as shock absorbers for the bones of the feet and legs, and provide insulation during cold weather. The cone shape of the carpal pad provides traction and balance along with the first toe on the front foot and the claws of the digital pads. The tissue that composes the foot pads of dogs will thicken and roughen due to friction on hard surfaces much as a human foot will develop a callus under similar conditions. 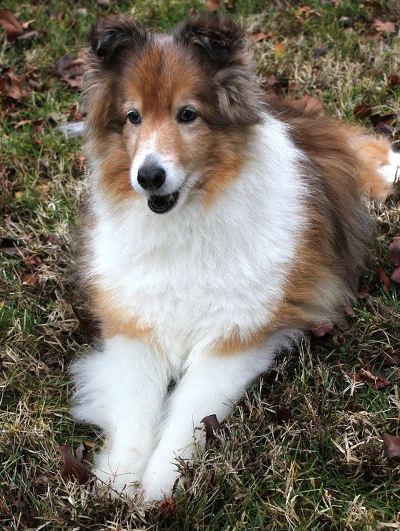 Very old dogs may begin to show a degeneration of the pads (creases, indentations). In older dogs (as well as other animals) individual toes may begin to drift out of alignment with the other toes. Canines have 4 fully developed toes that register on front foot tracks. An additional smaller toe (referred to as "toe 1") is reduced and occurs higher up on the front leg and only registers in tracks occasionally when at higher speeds, in deeper substrates, or during during abrupt stops/turns. Claws usually register with most canine species. Front tracks are usually longer than wide. The negative space is in the shape of an ‘x’ or an ‘h’ and the metacarpal pad is usually triangular and singular, not divided into sub-pads. A single carpal pad sits posterior to the metacarpal pad on the lateral side of the leg. The total area of the digital pads is greater than the area taken up by the metacarpal/metatarsal area. 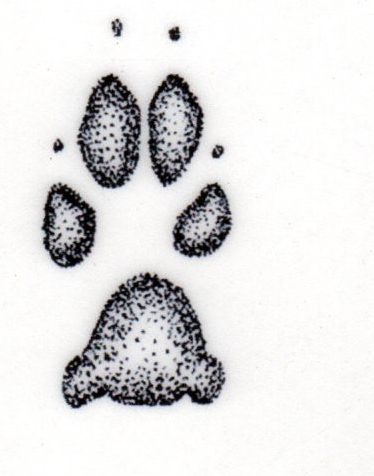 The tracks of canines when split bilaterally lengthwise will show more symmetry than feline tracks (see example feline track below). Hind tracks are similar to the front tracks but differ in being narrower and having less registration of the metatarsal pad due to the steeper angle of the ankle joint on the hind foot. A)	The negative space tends to be horizontally elongated; sometimes referred to as star-shaped. B)	The claws on the outer toes tend to be prominent and divergent from the middle portion of the track. C)	Claws are usually blunt. (some domestic dogs may not show any claws due to being de-clawed). D)	The middle toes extend below a line drawn across the tops of the outer toes. E)	Toes are large and blocky (usually larger than the tip of your index finger). The outer toes are often smaller than the larger inner toes. The outer toes often cup the middle toes on the inside of the digital pad. F)	Tracks are often splayed due to the animal being overweight. G)	Metacarpal pad triangular in overall outline with a “pinched” area near the anterior portion of the pad. H)	Metacarpal pad tends to be flat and wide with the metacarpal pad registering on the same plane as the digital pads. Note: The vast majority of domestic dogs have tracks that will measure under 100 MM in length. Only the largest breeds such as great danes, saint bernards and irish wolf hounds will meet or exceed that length. A)	Overall the track is narrower than the front track. B)	The metatarsal pad registers lighter than the metacarpal pad and consists of an elongated oval. C)	On the lower sides of the primary oval are two smaller wing-like sub-pads. 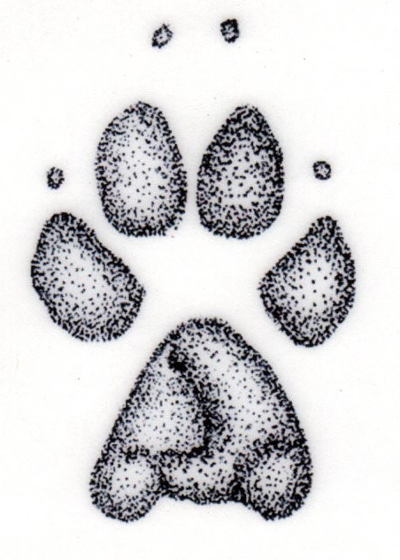 Many breeds of domestic dog have tracks classed as cat-footed. Cat-footed breeds have tracks that have an overall rounded shape reminiscent of cats. Cat-footedness is an adaptation for weight bearing and is found in many large working breed dogs. Canine footed breeds have feet that more closely resemble the feet of wild canines such as coyotes. Hare footed dogs have elongated central toes that allow for quick acceleration much like the feet of lagomorphs (rabbits and hares). Breeds that exhibit hare-footedness are terriers, borzoi’s, and greyhounds. Additional Note: Webbed Feet - Certain breeds such as Labrador retrievers exhibit mesial webbing between the digital pads that aid in swimming. Many hunting breed dogs also exhibit this trait. 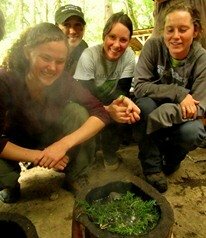 Earn Certificates in Wildlife Tracking and More. The tracks of large dog breeds and wolves can be difficult to distinguish. Most large domestic dogs are cat-footed and the tracks tend to splay more than the tracks of wolves. The outer toes in wolves will splay in deep substrate, at higher speeds, or in large males. The middle two toes will stay tight in wolves, while often slightly splaying in domestic dogs. 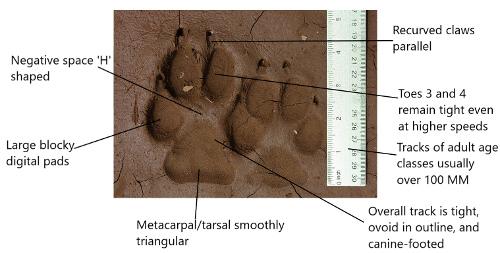 Overall, the tracks of wolves tend to be more digitigrade (toe heavy) with deeper digital pad registration than metacarpal/tarsal pads. 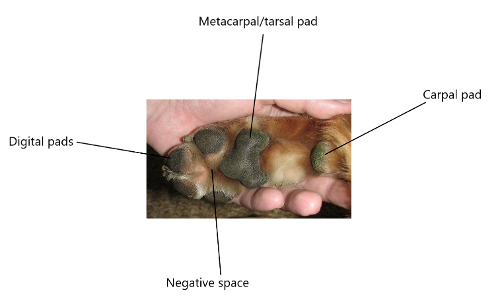 Domestic dogs tend to have tracks that are flatter (the metacarpal/tarsal registering nearly as deep as the digital pads). As mentioned earlier, the middle toes (called toes 3 & 4) sit on a higher plane than the outer toes (called toes 2 & 5), giving the digital pads of the track a 2-ranked appearance in wolves. The track patterns of domestic dogs also tend to be sloppy and inefficient with their use of energy (lots of direction and speed changes), while the trails of wolves tend to be more efficient and purposeful (straighter lines and more consistency in gaits). Note: In wolves, younger age classes may have tracks between 75-100 MM in length. 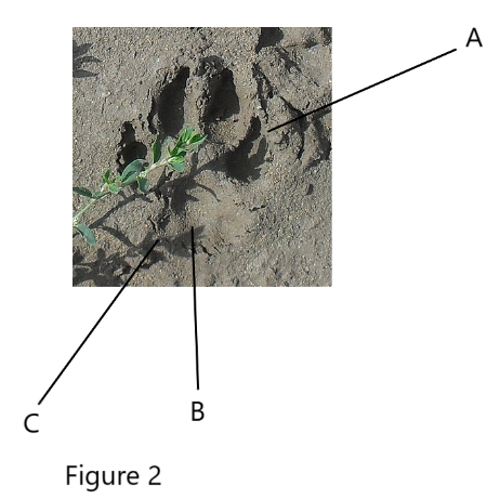 Many of the same identification features discussed in the wolf/dog vignette will also aid in the identification process of domestic dog tracks versus coyote tracks. The toes of red foxes are more wedge-shaped than the toes of domestic dogs and other canids. Red foxes have fur-covered pads which helps differentiate them from small and medium-sized domestic canines. 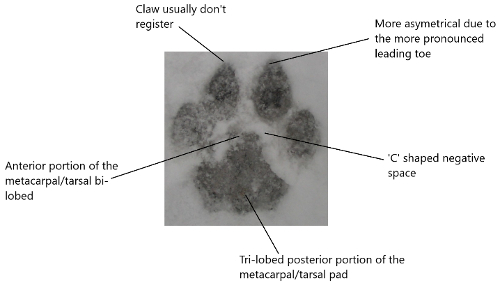 The tracks of Canadian lynx differ from domestic dogs in having a ‘bean’ shaped metacarpal/tarsal pad instead of the triangular pad of the dog. 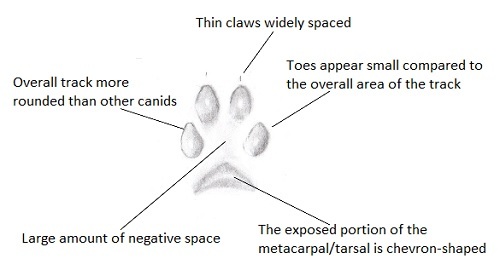 The digital pads of the lynx rarely show claws and the negative space is large and wide, as compared to the smaller ‘x’ to ‘h’ shaped negative space seen in dogs. Lynx also show significant spacing of the digital pads due to abundant fur on the feet. The tracks of domestic cats can resemble those of small domestic dogs. Domestic cats have the characteristic tri-lobed posterior metacarpal/tarsal pad as well as the bi-lobation of the anterior portion of the pad (sometimes the metatarsal pad of the hind foot will only show a single lobe). 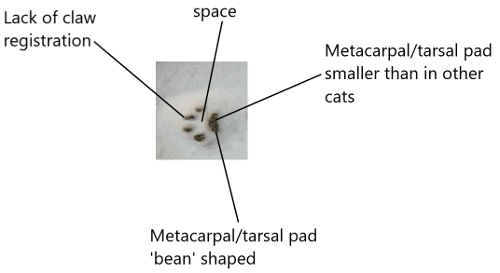 Domestic cats have large digital pads in comparison to the area of the metacarpal/tarsal resembling the ratio seen in canines. Domestic cats, especially as they age, are prone to a loosening of the claw attachment tendons which leads to a higher proportion of tracks with claw registration. Although knowing how to identify the tracks of domestic canines may lack the mystery and charisma associated with tracking wild canines, the skill holds still holds a valuable place in the tool-kit of those devoted to non-invasive wildlife studies. 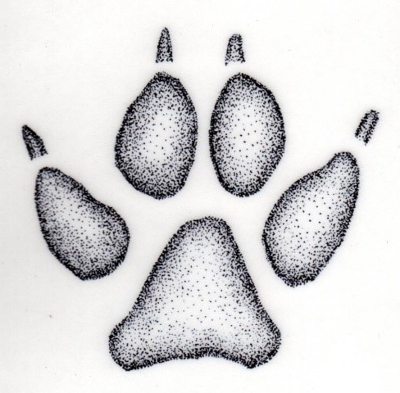 The skills gained through the study of domestic dog tracks apply to a variety of situations both in town and in the backcountry, and your studies can begin right outside your backdoor! About the Author: Chris Byrd is a core instructor at Alderleaf. He has been teaching naturalist skills for over fifteen years. Learn more about Chris Byrd.